So…. I was vegetarian for a long time before I became vegan. I went vegetarian in 1999 and vegan only in 2005. So there were a few years there where I was still sampling all the eggy/dairy things! 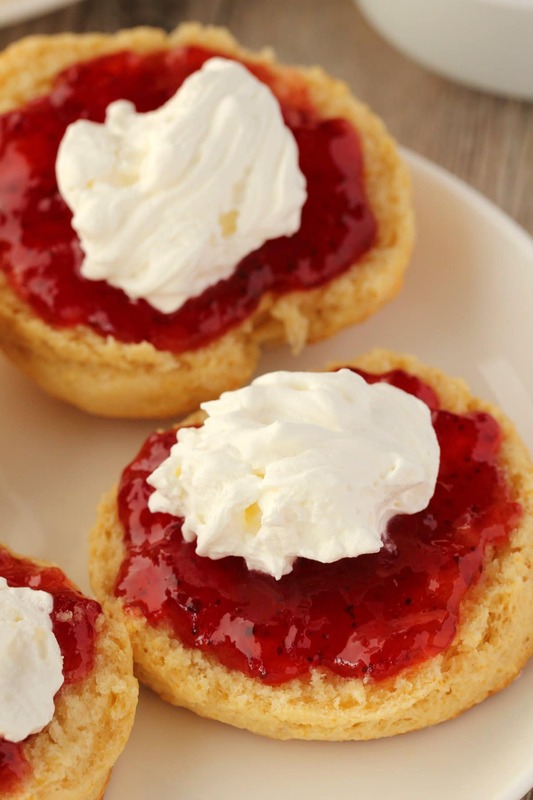 And one of my favorite eggy/dairy things was scones with jam and cream! 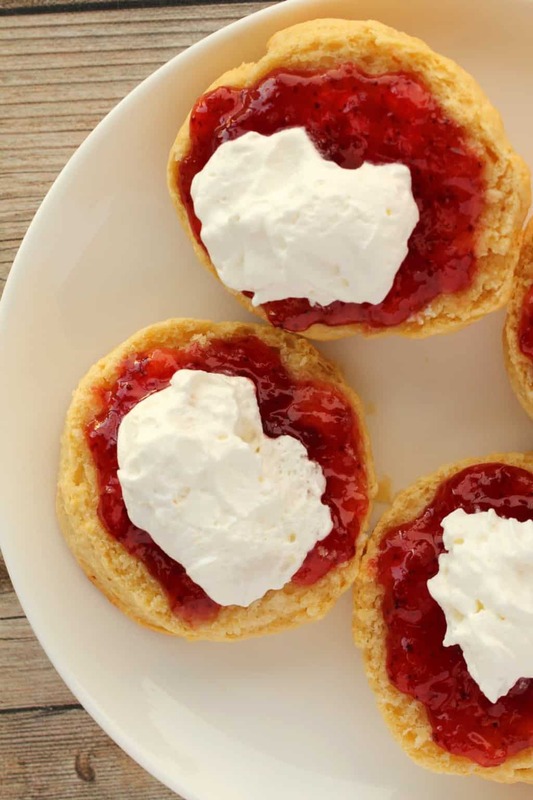 When I moved to Cape Town in 2003 there was this little cafe on the mountain that had the most fabulous scones with jam and cream. And going there for tea looking out over amazing views over Cape Town was something special. And literally from the last time I went to that cafe in my pre-vegan days to now I don’t think I had eaten a scone. I hadn’t come across any vegan ones anywhere and I hadn’t got around to making any vegan ones myself. But I’ve ALWAYS had it in mind that vegan scones are something I want to make one day! Well, I finally got around to it now and man oh man I am glad I did! These scones are sooooo good! And they are seriously easy to make too! They cook in like 20 minutes! And they’re fun to make too, you get IN THERE with your hands, it gets a little messy, and that’s pretty fun actually! This recipe requires just 8-ingredients, and the process is crazy simple. 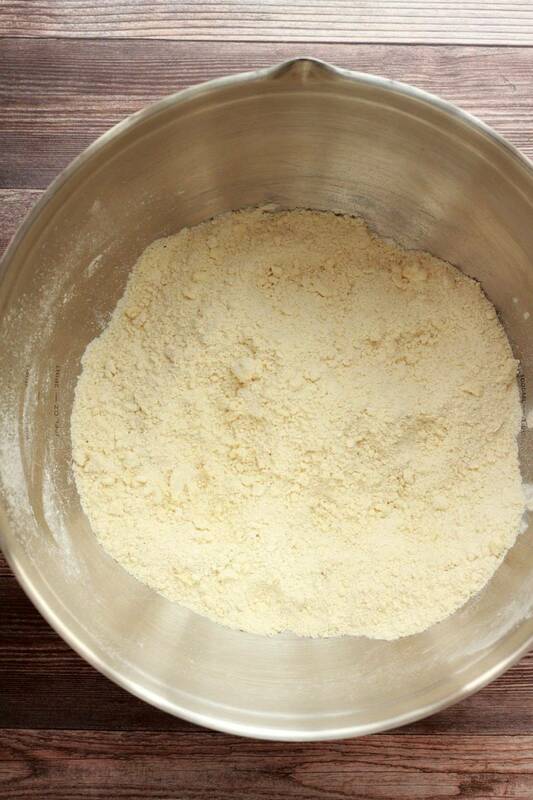 You sift your flour into a mixing bowl and add salt and baking powder. Then you add in vegan butter or vegan margarine and rub it in with your hands until it gets to a crumbly texture (as below). Then you add some caster sugar (which is just very fine sugar, and I believe it’s called super fine sugar in the USA), then add some soy milk, vanilla extract and lemon juice and mix in with a spoon. 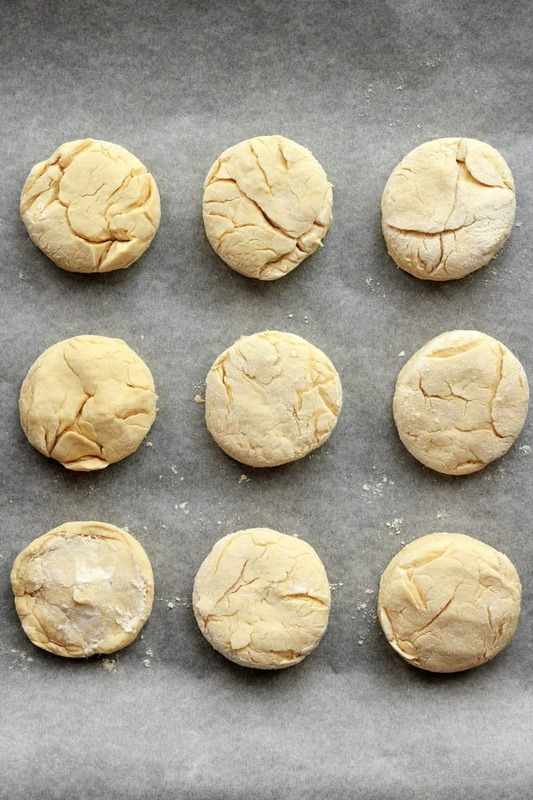 Then comes the fun part, you add more flour to alleviate any stickiness from the dough, roll it into a ball and then flatten out with your hands. 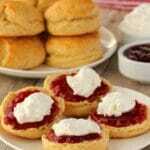 Using a smooth cutter, dip it in flour and then cut out 4 scones. 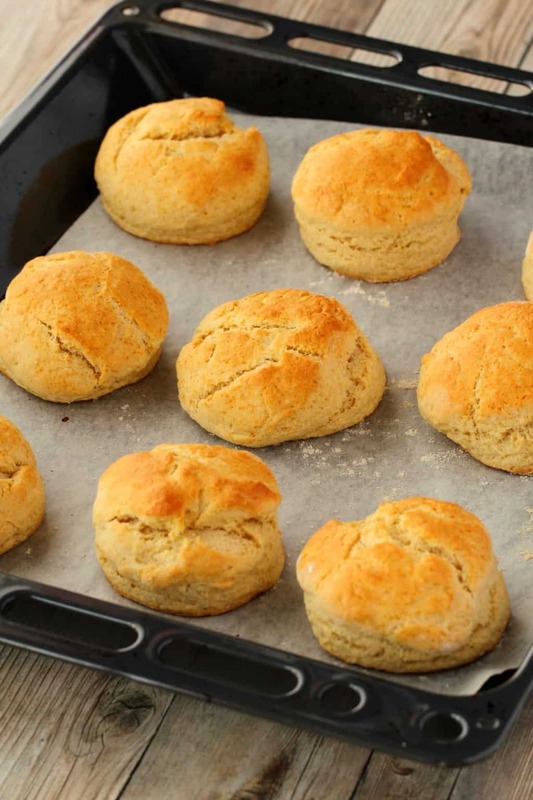 Roll again, cut out 2 scones, roll again and cut out 2 scones and then whatever is left is your final scone. 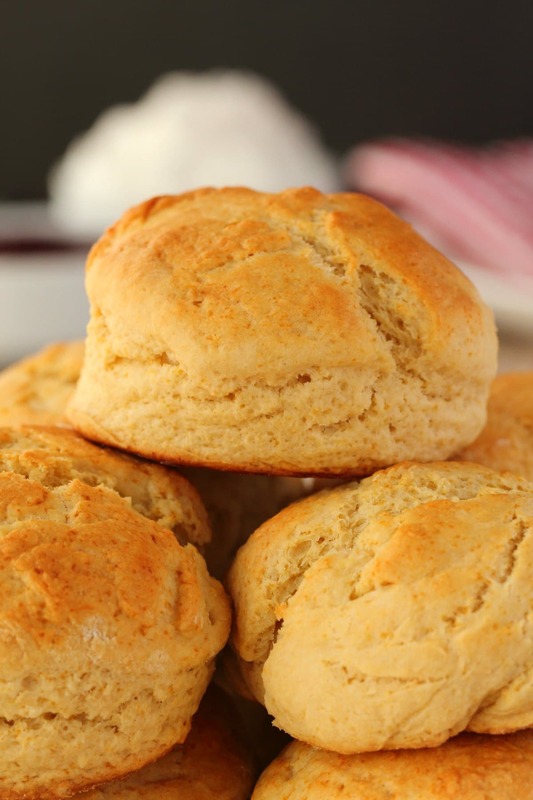 Place your scones onto parchment paper on a baking tray and then brush with some soy milk (or other plant milk) – this is what makes it brown on top. Pop it into the oven and bake at 430°F (220°C) for 20 minutes! 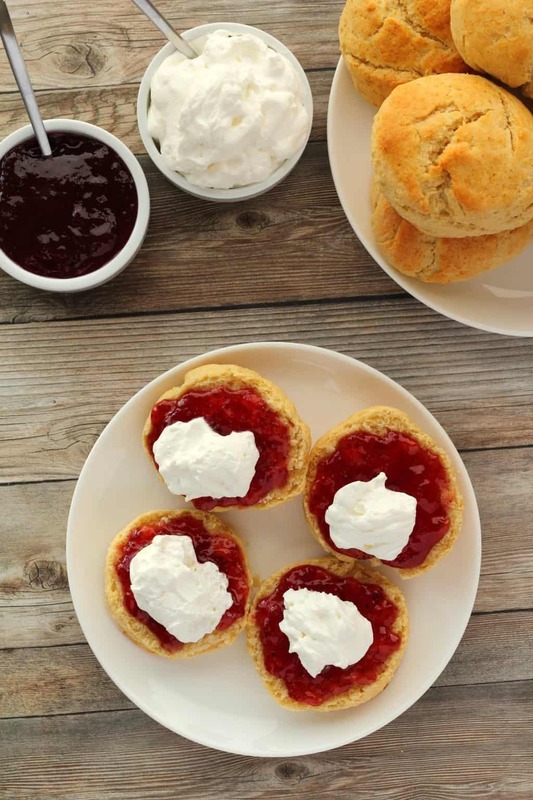 Serve with jam and whipped coconut cream for the most fabulously delicious tea time treat. One time I made these I forgot to add in the sugar! And they were still delicious, just more savory tasting, but since you smother them in jam anyway, it’s no biggie! Just mentioning that in case you prefer to keep sugar to a minimum. 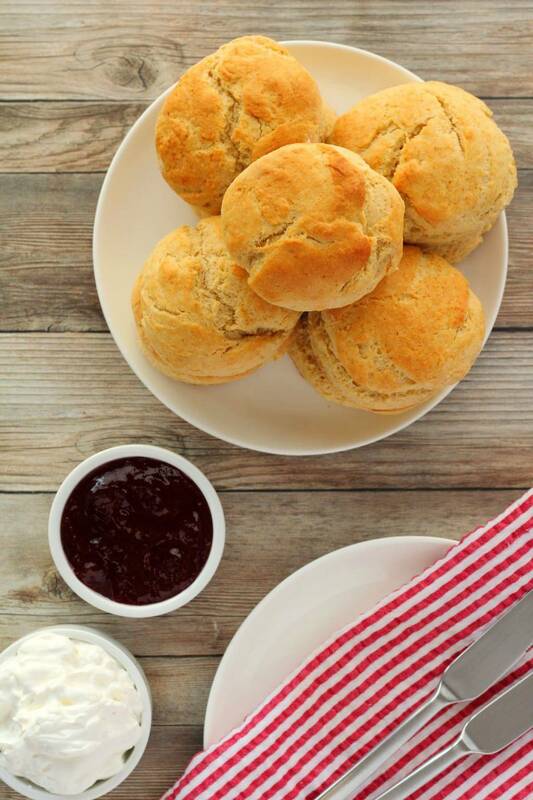 What is awesome about these vegan scones is that they are so easy to throw together, fun to make, crumbly, scrumptious, and one of the best things ever served with jam and cream or even just jam by itself. 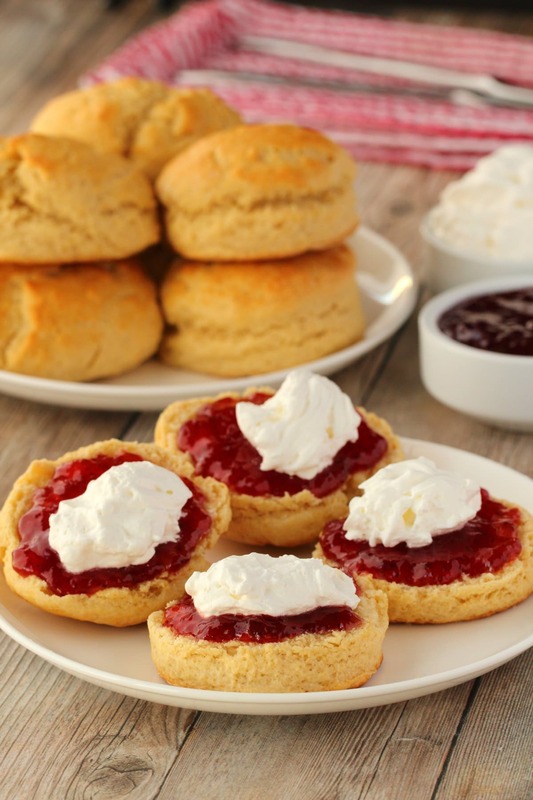 These scones are fabulous to have for teatime, as a dessert or even for breakfast! Fabulous with jam and vegan cream! They are most amazing when absolutely fresh. Even one day after baking, they are not nearly as good as the day of. So scones don’t really work as a ‘make ahead’ item. Keep them stored at room temperature and enjoy fresh, the fresher the better, but definitely within 2 days. 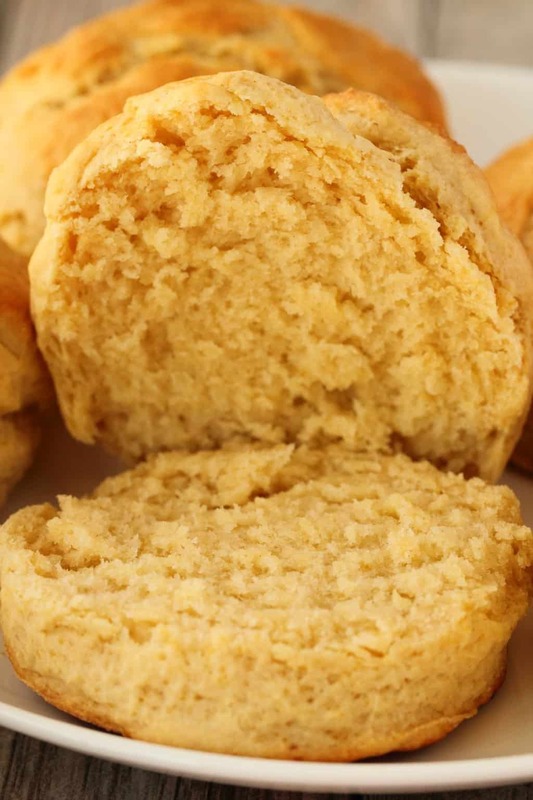 So I’d love to hear what you think of these delectable vegan scones! Let us know in the comments and please rate the recipe too! Sign up to our email list for a fabulous (and free) dinner recipes ebook and to be the first to know whenever new recipes are posted to the blog. 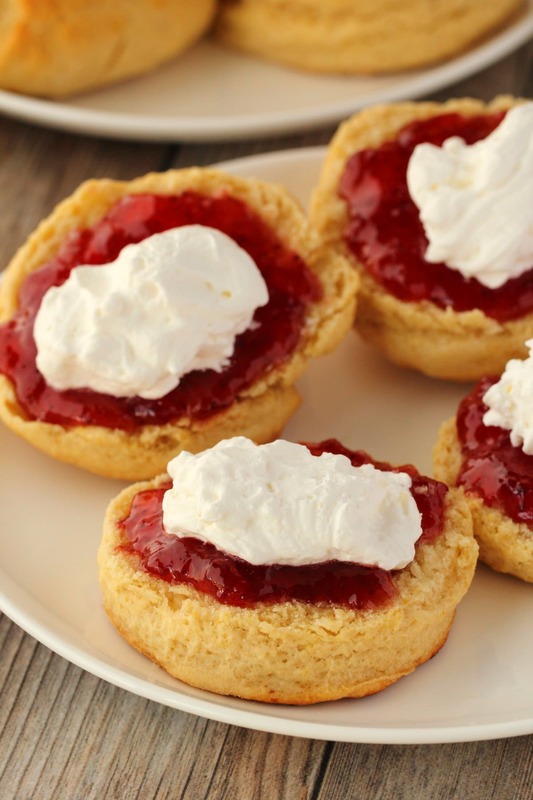 Light and crumbly vegan scones served with strawberry jam and freshly whipped coconut cream. 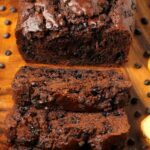 Absolutely delicious along with your afternoon tea, as dessert or even breakfast. Sift the flour into a mixing bowl and add salt and baking powder. Add the vegan butter and rub in with your fingers until the mix is crumbly. Then add the soy milk, vanilla extract and lemon juice and mix in with a spoon. Flour your work surface and your hands, and add extra flour as needed as you move the mix out of the mixing bowl and roll it with your hands into a big ball. 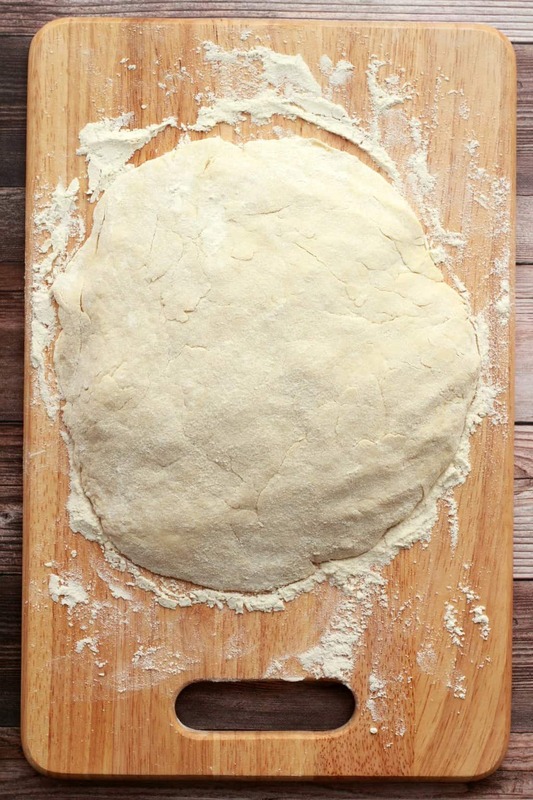 If the dough is sticky at any point, add more flour. Flatten it out so that there is space to cut out 4 scones. 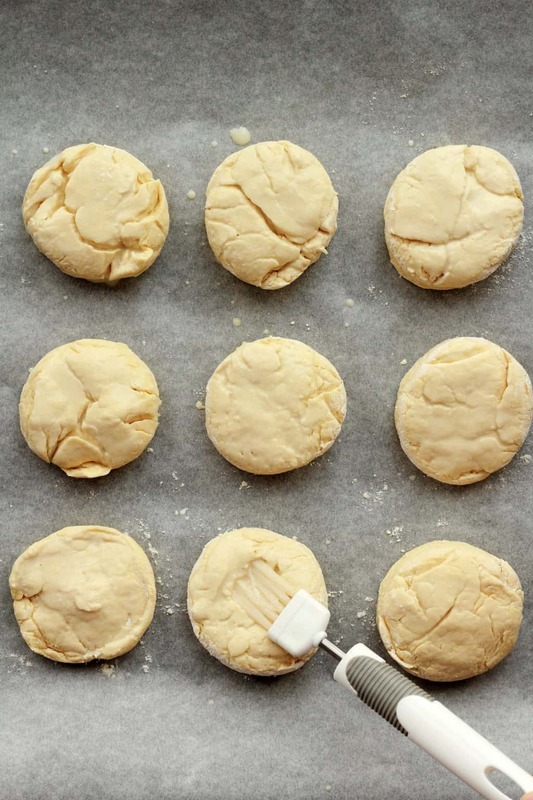 Dip a smooth cutter in flour and then cut out 4 scones and place them on a parchment lined baking tray. 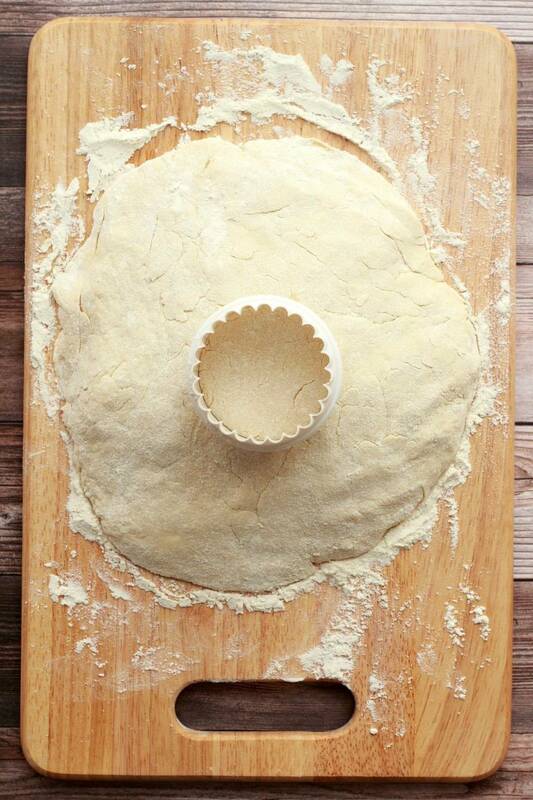 Roll the remaining dough and cut out 2 more scones. Roll again and cut out another 2 scones, with anything left over becoming the final scone. Brush the tops of the scones with soy milk. Bake in the oven for 15-20 minutes until golden on top. Serve with jam and whipped coconut cream. *If you can’t find caster sugar (super fine sugar), you can use regular granulated sugar. *You can use a different non-dairy milk such as almond milk if you prefer. *The lemon juice is about what you’ll get from squeezing one small lemon. *The baking time variance is really in how golden you want the tops of the scones to be. If you bake them for 20 minutes they can get very nicely browned on top, whereas at 15 minutes they are only lightly browned. Either way they are great. Because of oven variance though, it’s definitely best to check on them at the 15 minute mark and see how they’re looking. *Nutritional information is for 1 scone of 9, without jam or whipped coconut cream. Hi Candice, sorry to hear they weren’t a success. I’m really not sure what might’ve happened. 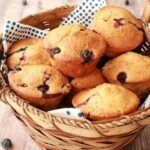 Do you bake other things regularly? I’m just wondering if your oven temperature was correct, but if you bake other stuff then that probably isn’t the issue, but if you’re new to baking, it could be that your oven wasn’t the correct temperature. You can get an oven thermometer to check that. Otherwise if you used all the right ingredients (like you didn’t substitute any ingredients) then I’m really not sure! 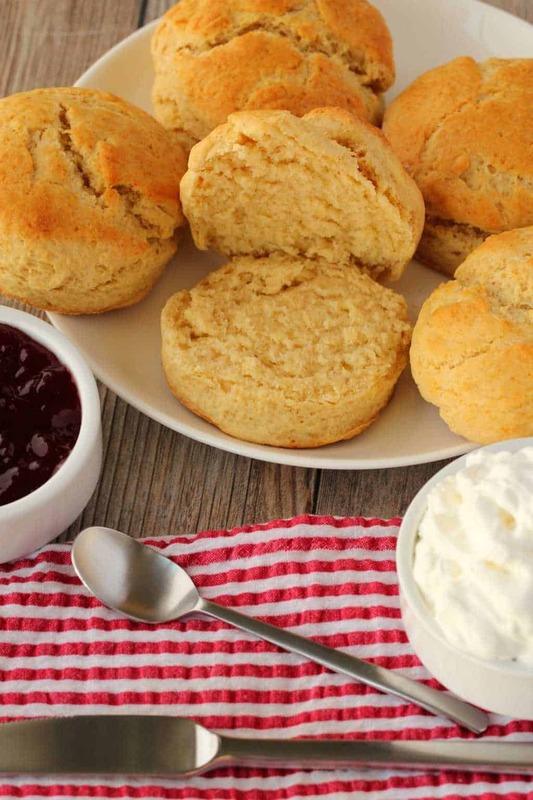 Yes, they can, there are some helpful tips for freezing scones here. My daughters had a wonderful time making these for father’s day,they look amazing and he loved them thanks for sharing. I’m so grateful that you created this website. I tried your recipe and the scones were darn close to the real thing, but the flavour was just slightly lacking. It probably just needed more sugar/vanilla extract/lemon juice than the amounts stated in your recipe. Also, I usually don’t mind the taste of coconut in curries and Asian savoury dishes but I strongly dislike it in vegan ice creams and in this case vegan cream, so I made mine with soy milk and rice bran oil instead. The soy cream came out really runny, which made tea-time messy (but still enjoyable). Seems like I just needed to add more oil in the blender. It was delicious with rasperry and apricot jam though. Hi Alison! I’m so excited to make these! I made several of your recipes and I’ve never been disappointed. 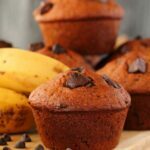 You’re my go to for many Vegan recipes! Keep it up! You’re amazing. Just wondering if I could add dried fruit or zest to make a variety of scones? These are delicious! They are the fluffiest vegan scones I have ever made. My butter obsessed husband said they are the best he’s ever had. I halved the sugar and they were still super tasty with or without toppings. Thank you! 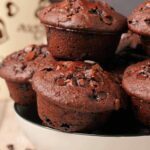 I’m going to make these tomorrow, but would I be ok to add some sultanas into the mix without it changing anything do you think? My older sister has celiac disease and has asked me to make scones for her since I bake a lot for her. 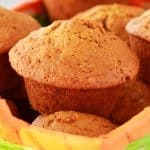 Are there any adjustments to this to make it gluten free or can I just follow this recipe with gluten free flour. Excellent! My daughter is vegan, so I made these for a family birthday tea and everybody thought they were great – vegans and non-vegans alike! Greetings, Alison! 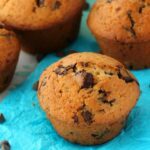 I tend to be very nervous about trying online recipes but wow, this one you created is fantastic. Thank you so much for all the pix, descriptions and detailed instructions. I live in France and so had no baking powder. So what I did is added instead 1/4 teaspoon of baking soda, and one extra tablespoon of lemon juice, and the scones were valiant and rose beautifully!! Also, I didn’t have a pretty mold, and as necessity is the mother of invention, I simply took globs of the beautiful dough and quickly and gently rolled them into small individual balls, smaller than tennis balls, then flattened and laid them on well-floured aluminum foil. (had no parchment either!) where I gently flattened them a bit so they’d look as much like yours as possible. I ended up with about 12 scones this way, Otherwise I followed your recipe to the letter. The scones couldn’t be more delicious. Again, all my gratitude for such a wonderful vegan recipe. The whipped cream turned out fine as well, but of course is it rather coconutty–wonder if aquafaba might make for a more neutral whipped cream? Have a lovely holiday. Thanks for your feedback, Alison. Yes, there are some commercial vegan whipped creams here in France and those would be fine. In fact, I ended up tasting the coconut again later and realized there was no need to fight the flavor. It’s a lovely alternative flavor unto itself, and had real staying power. Replacing it in the fridge for a couple of hours, and it was still perfect after. I just needed to whip it again lightly to make it glossy once more. What a great addition to Christmas entertaining this year, and any elegant afternoon tea. Absolutely amazing! Went in with doubts. Came out a believer! Is the vegan butter cold or softened at room temperature? I can’t wait to make these! Thanks. Holy mackerel! I had low expectations because I didn’t think vegan scones would be very good but these were as good as the conventional kind! I didn’t have self rising flour so I made my own (lots of recipes online… basically flour plus baking powder and salt). I had to use regular sugar instead of caster sugar. I also sprinkled the tops with sugar. The scones were unbelievably moist and fluffy with crunchy tops. I couldn’t believe how much they puffed up. My husband and I both loved them. This recipe is a keeper. Very easy, and absolutely perfect! I used the miyokos European style vegan butter. So easy to make and they came out perfect!! The exact taste and texture I was hoping for!!! Thank you sooo much for this recipe!